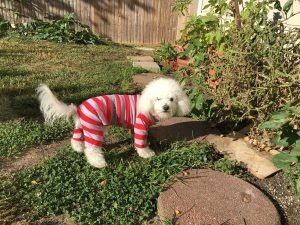 Human allergies and dogs – Mozzie Pants, Pants for dogs and dog suspenders! Human allergies and our dogs can be a challenge. If you are like our house, the humans have seasonal allergies. Spring is especially challenging in hour home, walking with your pup and you can see the allergens in the air floating around and landing on us ultimately entering the house. It is important to not wash your dog to often or you can cause skin challenges. Their coats need the oil to maintain healthy skin. The link below will give you guidelines on how often to wash your pup, the general rule is once a month. Mozzie dog pants and tops can help keep these allergens at the front door. The cotton garments are light enough to be worn in high allergy seasons, Spring and Fall. Putting your pup in the dog pants prior to walk and then taking them off at the front door will help contain the allergens from entering your living environment. Take a damp cloth and wipe the pups head and feet to enhance the decrease in the pollen in your home. This entry was posted in Mozzie's Thoughts and tagged dog diaper, dog pant, dog shirt. The challenge of hot spots, our dog pants can help!